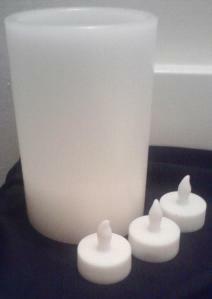 Candles are used all over the world in religious ceremonies of all kinds. My time in church as an acolyte, i started off every service by lighting the candles and extinguishing them at the end. In Pagan and Wiccan rituals they are for the light of the Goddess and God, as beacons to the elements and for other spells and rituals of candle magic. But for the rest of us, candles might not be an option. Candles can cost with some pillar candles can end up being $10 (US) a piece and some spells and rituals calls for more than one. I lived for a long time in a dorm where we were not allowed to have candles of any sort and they would be confiscated on sight. It is very understandable. For how many people set their apartments on fire with an electric stove or tinfoil in a microwave (I’m not kidding), it was very wise of Student Housing to restrict the use of incense and candles. 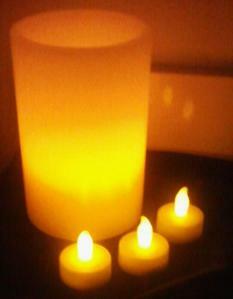 So I used the only thing I could, flame-less battery operated candles. These gave my rituals a light (though not a warmth) that I had been missing. I was able to put them anywhere and not be afraid of burning my alter cloth. 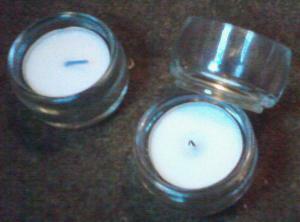 I treated them as real candles, I anointed them and. When a spell calling for specific color candle, I could cover the body of it with a cloth or paper of the needed color and remove it afterwards. Yes, these candles don’t have that same feel of real candles but I would recommend them to anyone who may be afraid of using real candles or in the situation I was in. I currently use them on my tiny altar on a shelf due to my fear of burning down my bedroom. 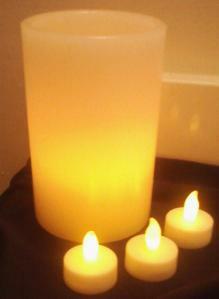 After I left the dorm I felt very excited to be able to use candles openly and without restriction. The first thing I did was go out and buy tee lights and tiny candle holders. I almost forgot the lighter. I’m not a smoker so I don’t usually have them laying around and before that all I had to do was flip a switch. I was very nervous about the candle. I didn’t want to be the one to set the apartment on fire not a month after signing the lease. I anointed some candles for use and set them on my alter… but wait. Ah yes, candles have colors. All I have are white. How do I solve the color candle problem. I don’t want to use cloth or paper around them like I had before. Those cheep glass holders were clear, but I could paint them for my purpose. These two of the candles on my alter now, silver for the light of the moon of the goddess and gold for the sun god’s warmth. Many places I have read say that one should not use scented candles. The only reason I can see to not use one is that too many smells can be over powering. If you use any sort of incense or herbs in your rite, I would advise not using these scented candles. Now If you are using one candle for a rite and no more, then a scented candle could be permissible. Its like combining incense and candle and if the smell is appropriate for the rite, even better. Look for candles after holidays. After Halloween i got a bunch of cheep scented candles. they are all red, orange and black and are designed to last a long time. Once I did a rite with a candle to leave burning until it goes out and it stayed lit for over 12 hours. Also party stores are a good place to look. I got a few good white votive i use all the time that are meant to be used one tables at a dinner like a wedding reception. It is not the candle, it is the energy you put forth. If you feel most comfortable drawing up a candle or imagining it in your mind, whatever you use, its power comes from the spell caster, not the item. Great article – I love candles. I am really trying to stay away from scented candles and try to find soy or beeswax. A lot of scented candles, Scensy stuff, puts toxins into your air. We had a Scensy burner in our bedroom and both my husband and I were coughing more than normal – got rid of it – got rid of cough. Glad you are able to use real candles again! There is an energy to them that artificial just can’t replicate.